MMP offers three enriching ways for children to become involved during the school year as well as a camp during the summer. We have four levels: Pre-Twinkle, Beginning, Intermediate, Advance, and Mozart String Orchestra. There are three programs in MMP, School Program, Saturday Program, and Pre-Twinkle Program. The School Program provides quality after-school group lessons to elementary and middle school students during the school year. Students receive instruction weekday afternoons, with all instruments and supplies provided. They also meet on Saturday mornings to rehearse as an orchestra. The Saturday Program is open to children age 13 and younger who take private string lessons during the week and wish to supplement their instruction with group activities. 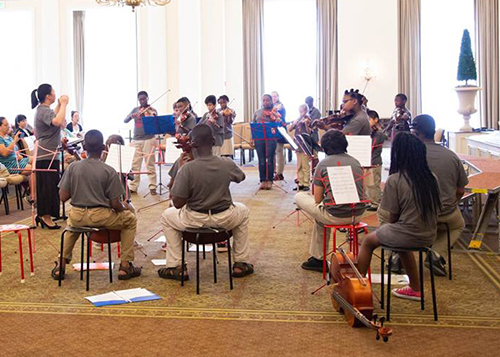 Weekly sessions include orchestra and choir, and also monthly master classes and sectionals. Designed with our youngest students in mind, the Pre-Twinkle Program offers an introduction to music lessons and string instruments. Pre-Twinkle music is taught in conjunction with real instruments of their choice involvement. The youngest students will have weekly sessions which includes group classes and choir. The only requirement is during the group class, all parents must stay with their students.